What is the Schedule H? 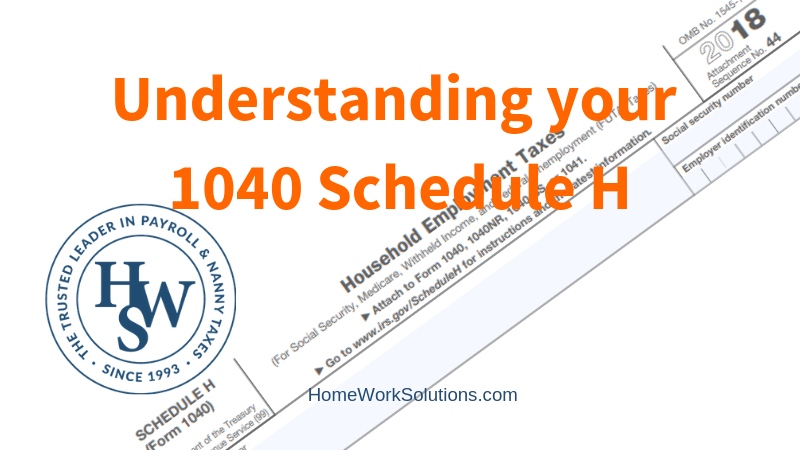 The Form 1040 Schedule H is the document that computes the amount of household employment taxes you owe and will add this tax due to your personal income tax return. The Congress incorporated household employment taxes into the Federal income tax return in 1995, and as a result submitting a personal tax return without including the household employment taxes became felony tax evasion. It was sold as simplification yet as a practical matter it became a powerful enforcement tool. It is vitally important that you start the Schedule H with the name and social security number of the individual who is associated with the Employer Identification Number. An error here can start a pen pal relationship with the IRS, something we all want to avoid! You will also need to provide the total amount of wages that were paid to your household employee(s) during the year and the amount of Federal Income Tax that you may have deducted from their wages. Social Security, Medicare and Federal Unemployment taxes are then computed on the form and added as tax due on your personal tax return. What household employment taxes are there to be included? The household employment taxes that you must account for on your Schedule H form will cover the primary taxes that are due from your direct employment of a nanny, senior caregiver, housekeeper or cleaning person , including social security tax (12.4%), Medicare tax (2.9%), and federal unemployment tax. Separate from the Schedule H is your state unemployment insurance tax, which is filed and paid directly to your state. There is a credit available on the Schedule H form that will allow you to reduce the federal unemployment tax related to your state tax payments. Why is the Schedule H total more than I withheld from my employee? Understanding the forms as well as all the differences between federal and state tax laws can be difficult and complicated. If you have multiple employees or simply feel overwhelmed at the process of filling out the paperwork properly, HomeWork Solutions can help make things easier for you. We are experienced in the changing tax laws and can make sure you have everything accounted for when it comes time to file your taxes. If you end up trying to fill out everything yourself, you may end up missing something that could trigger a fine or penalty later down the road. Avoid confusion and stress by working with our experienced team at HomeWork Solutions. Contact us today for information.